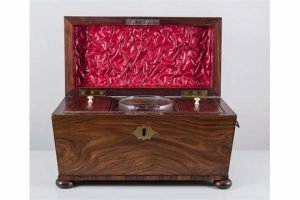 Victorian walnut tea caddy, sarcophagus form on four ball feet containing a mixing bowl and two lidded compartments, ring handles. 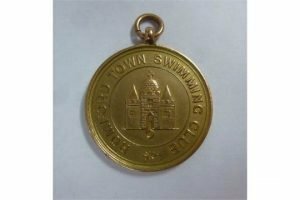 A 9ct gold medallion, cast for Romford Town Swimming Club, inscribed ‘Club Championship CP Mackay 1st 1925’. 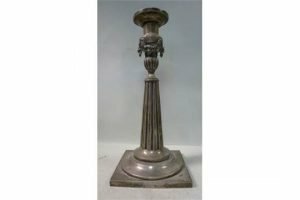 A white coloured metal candlestick, having a detachable cup sconce, the tapered, fluted stem with garland ornament, on a stepped base and square foot. 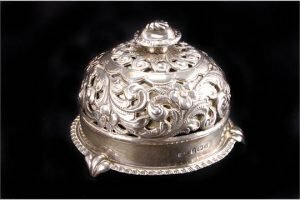 A late Victorian silver service bell, Birmingham 1900, pierced and chased with foliate scrolls. 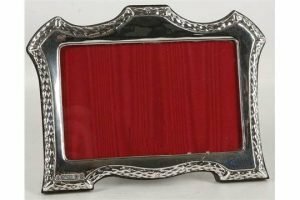 An elegant Britannia standard hallmarked silver (999 grade) photograph frame, embossed on the border with stylised garland ribbons decoration, having red silk interior and mahogany back support and easel. 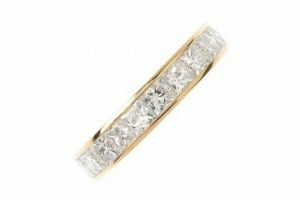 An 18ct gold diamond half-circle eternity ring, the square-shape diamond line, within a channel, to the scalloped sides and plain band. Estimated total diamond weight 2cts. 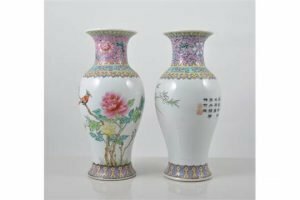 A pair of Chinese baluster shape vases, pink ground collars, decorated with birds and flowers, printed seal marks. 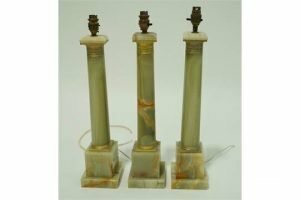 A set of three onyx and gilt metal table lamps, each in the form of a column on square bases. 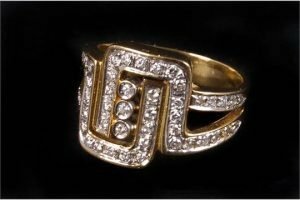 An 18ct gold and diamond ring, the bezel of Greek Key design, pave set overall with brilliants, with yellow gold shank. 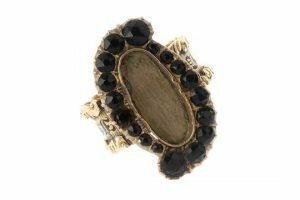 A gem-set memorial ring, the late 19th century onyx asymmetric cluster, to the mid 19th century 18ct gold grooved band, with black enamel script reading ‘In Memory Of’ and scroll embossed sides. 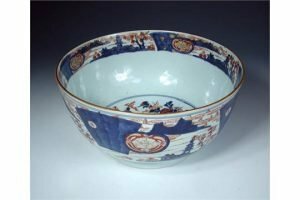 An 18th century Imari bowl, the interior painted with a central roundel of a gazebo in a fenced garden, the exterior with four maple trees growing by pagodas separated by blue fans. 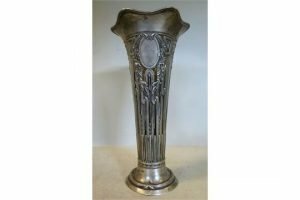 An early 20th Century Art Nouveau inspired silver coloured metal trumpet vase with a clear glass liner, having a flared, wavy, applied wire rim embossed and pierced sides, on a splayed foot. 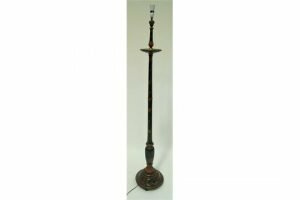 An early 20th century stand lamp with chinoiserie jappaned decoration on a black ground. 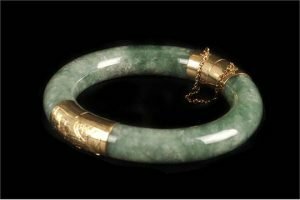 A Chinese nephrite hinged bangle, with engraved yellow metal mounts, with hidden snap clasp. 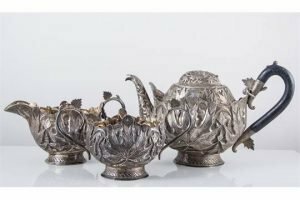 An Indian white metal three piece tea set, leaf design comprising teapot with ebonized handle, a milk jug and sugar bowl. 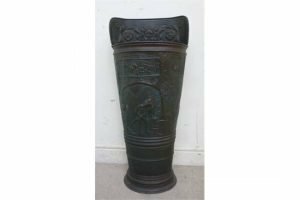 An early 20th Century patinated green and bronze finished copper grape-hod design stick stand, embossed with a street scene, other figures, mask and foliate scrolled ornament. 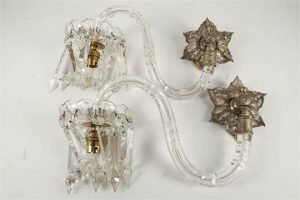 A pair of Edwardian single arm sconces, having swan neck crystal arms and prism hung drip pans, supported on wall from silver plated foliate wall plates. 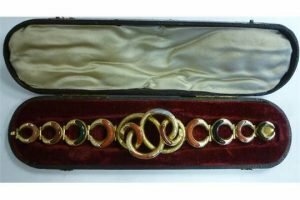 A foliate engraved yellow metal bracelet, set with multi-coloured hardstone, comprising a scrolled central section, flanked by three graduated, hinged, crescent shaped links. 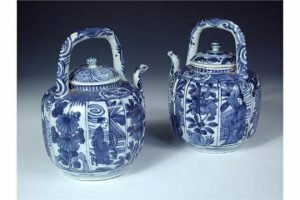 A pair of kraak blue and white teapots with covers, handles raised above fluted bodies painted with alternating panels of flowers and figures below brocading on the shoulders. 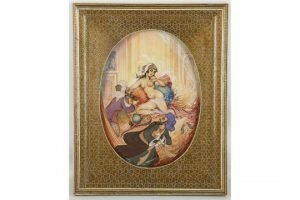 A 20th century oval Persian miniature of a naked harem girl with 2 gentlemen in attendance, fitted within a superb inlaid frame.